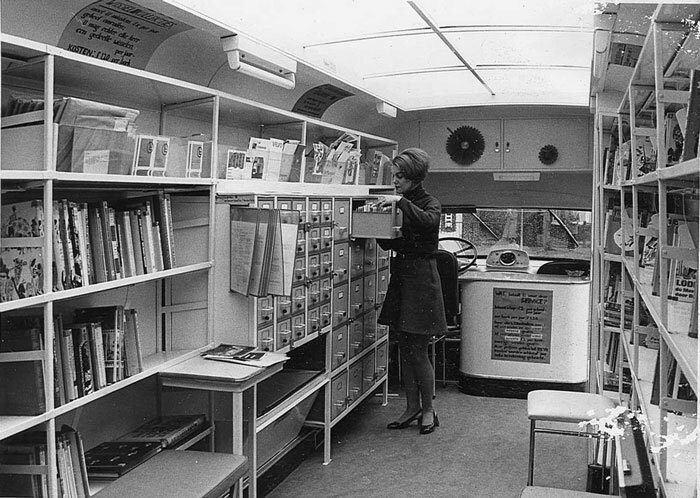 The bookmobile was a travelling library used to provide access to books to villages and city suburbs that had no library. It went from a simple horse-drawn cart in the 19th century to large customized vehicles that became part of American culture, which reached their height of popularity in the mid-20th century. 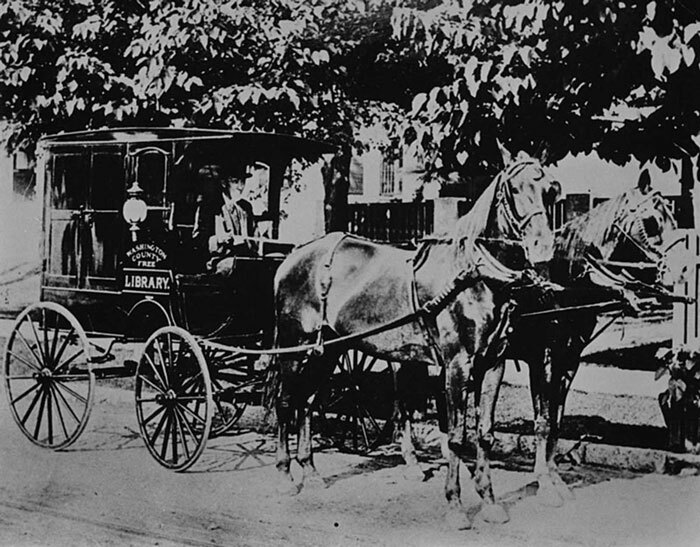 One of the earliest mobile libraries in the United States was a mule-drawn wagon carrying wooden boxes of books. It was created in 1904 by the People’s Free Library of Chester County, South Carolina, and served the rural areas there. 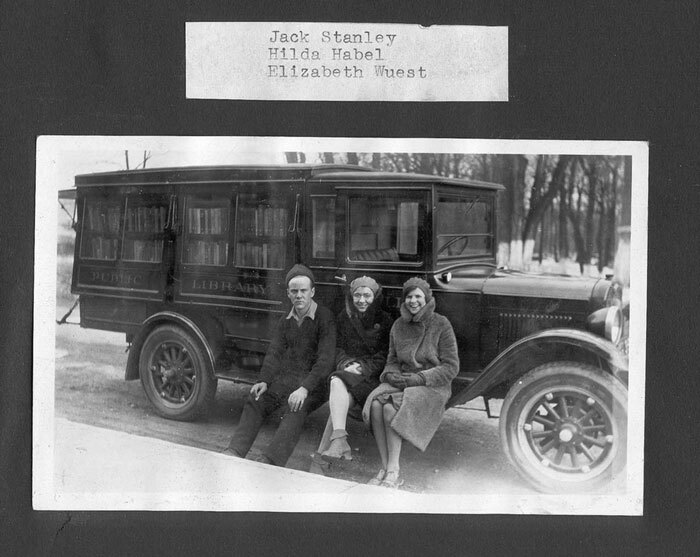 Another early mobile library service was developed by Mary Lemist Titcomb. As a librarian in Washington County, Maryland, Titcomb was concerned that the library was not reaching all the people it could. The annual report for 1902 listed 23 “branches”, each being a collection of 50 books in a case that was placed in a store or post office throughout the county. 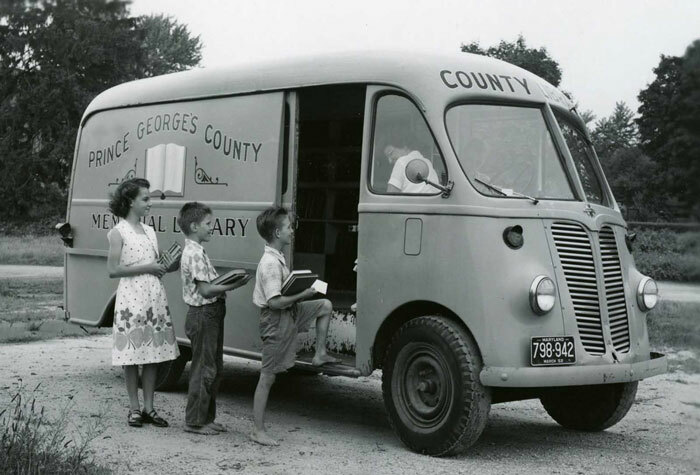 Realizing that even this did not reach the most rural residents, the Washington County Free Library began a “book wagon” in 1905, taking the library materials directly to people’s homes in remote parts of the county. With the rise of motorized transport in America, a pioneering librarian in 1920 named Sarah Byrd Askew began driving her specially outfitted Model T to provide library books to rural areas in New Jersey. 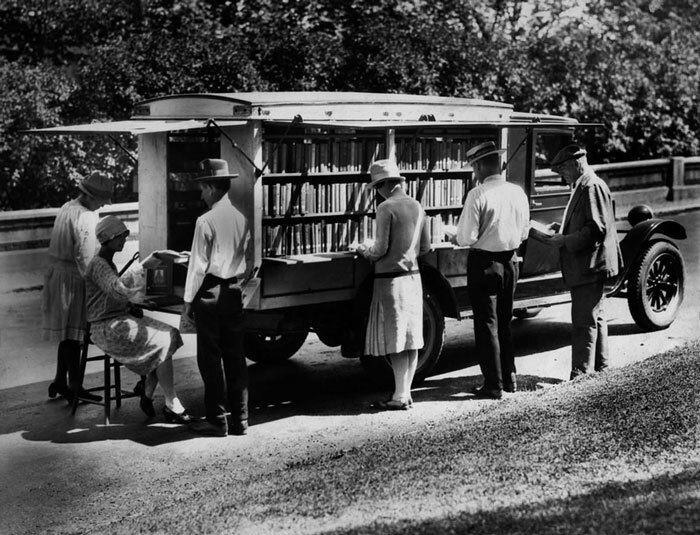 The automobile remained rare, however, and in Minneapolis, the Hennepin County Public Library operated a horse-drawn book wagon starting in 1922. Following the Great Depression in the United States, a WPA effort from 1935 to 1943 called the Pack Horse Library Project covered the remote coves and mountainsides of Kentucky and nearby Appalachia, bringing books and similar supplies on foot and on hoof to those who could not make the trip to a library on their own. Sometimes these “packhorse librarians” relied on a centralized contact to help them distribute the materials. 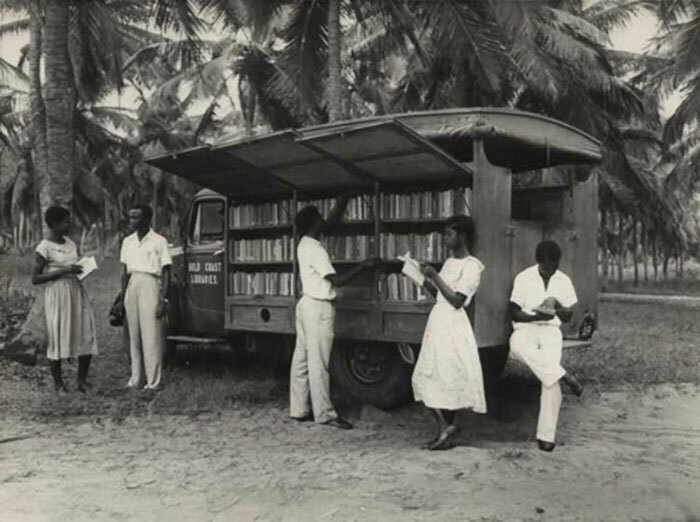 A bookmobile in Accra, Ghana, 1950s. A bus with a view, 1967. 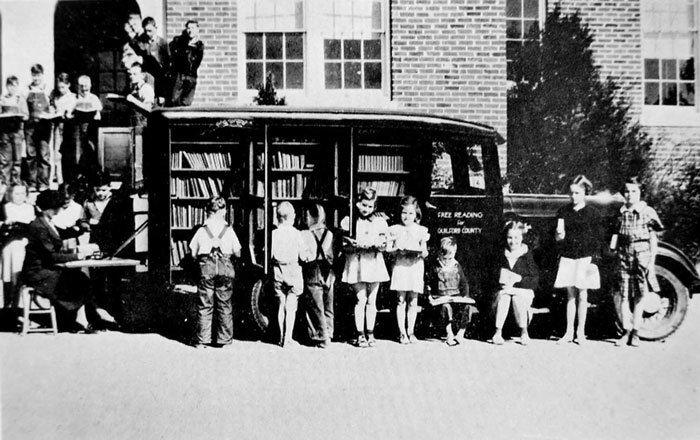 Bookmobile in Greensboro, North Carolina, USA. 170.770 volumes were circulated in 1936. 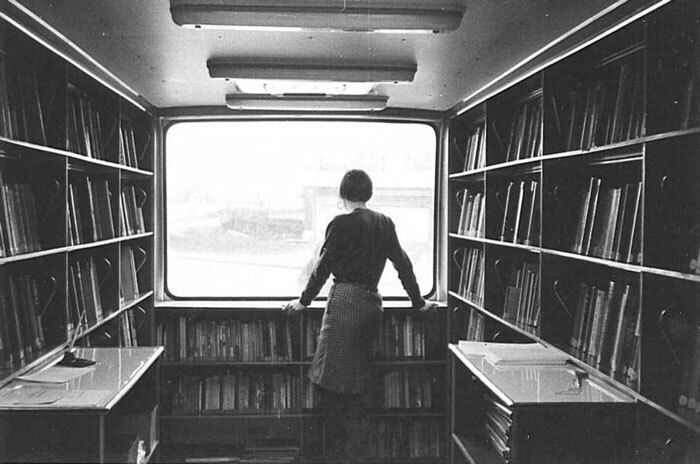 Inside a bookmobile, date unknown. 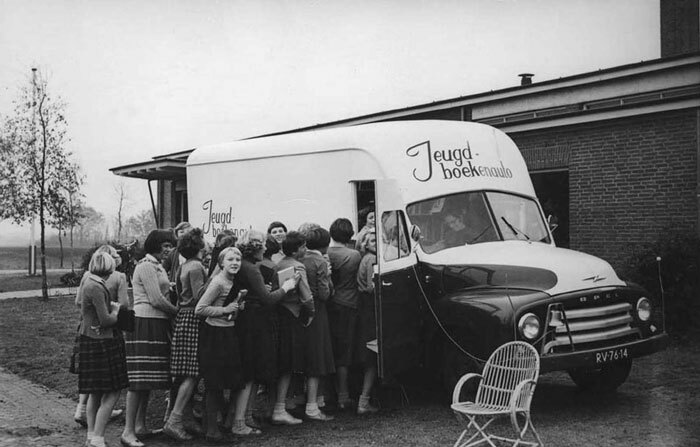 An early bookmobile horse and cart in Washington D.C.
An impatient queue for a Dutch bookmobile. 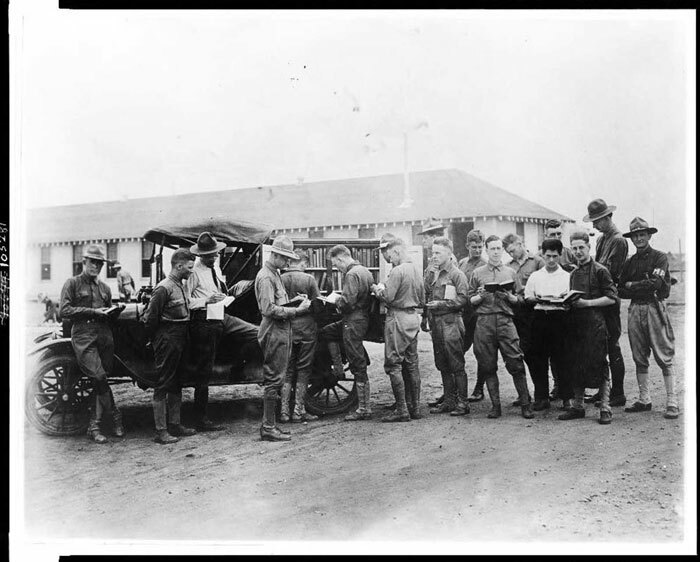 Soldiers getting library books from a truck, Kelly Field Library, Texas, c. 1917. 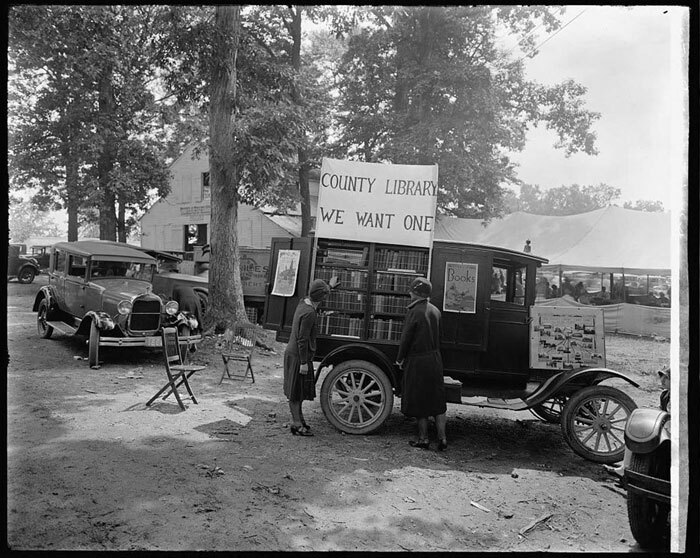 “County Library: We Want One”, Rockville Fair, Maryland, 1928. Children waiting at the Prince George’s County Memorial Library, Maryland, 1951. 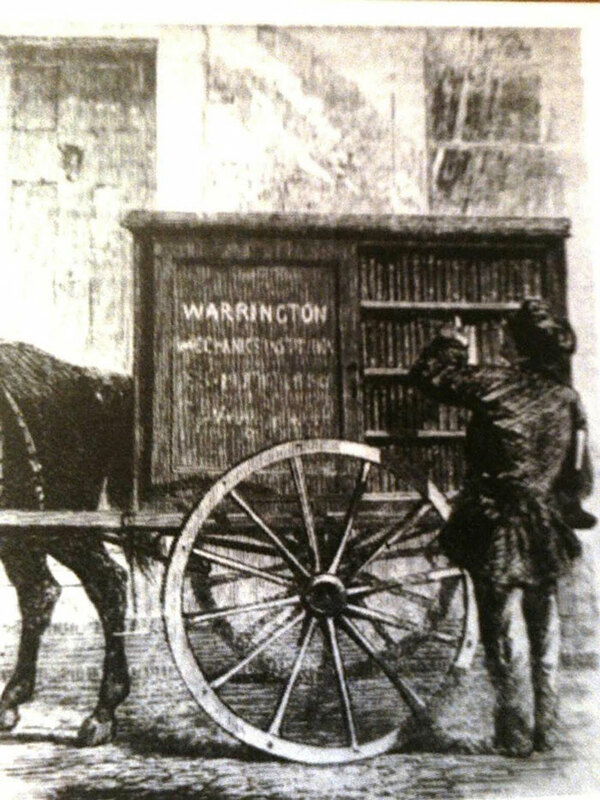 One of the earliest mobile libraries, the Warrington Mechanics’ Institution Perambulating Library, from The Illustrated London News, 1860. 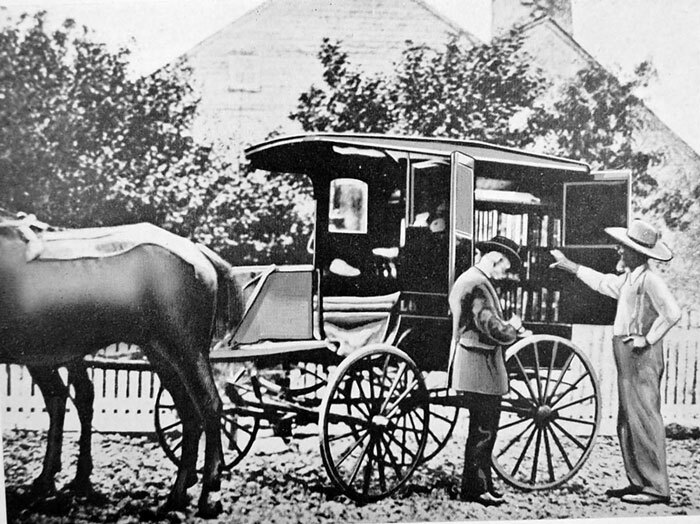 One of the earliest book wagons in the United States, the Washington County Free Library, Maryland, c. 1905. 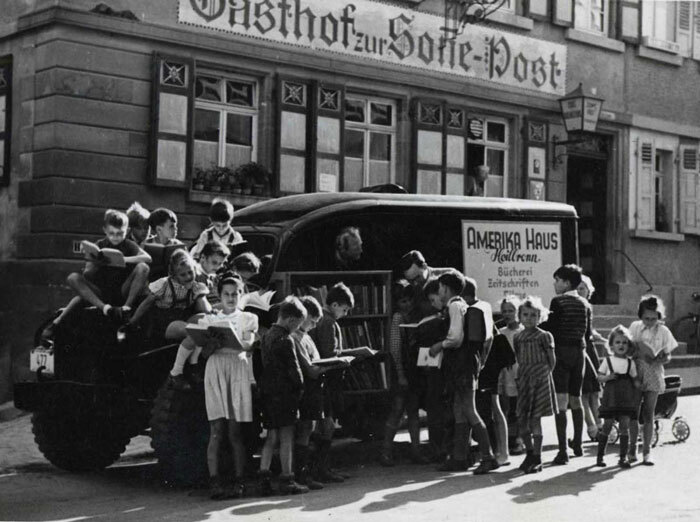 A bookmobile in Germany, late 1940s. 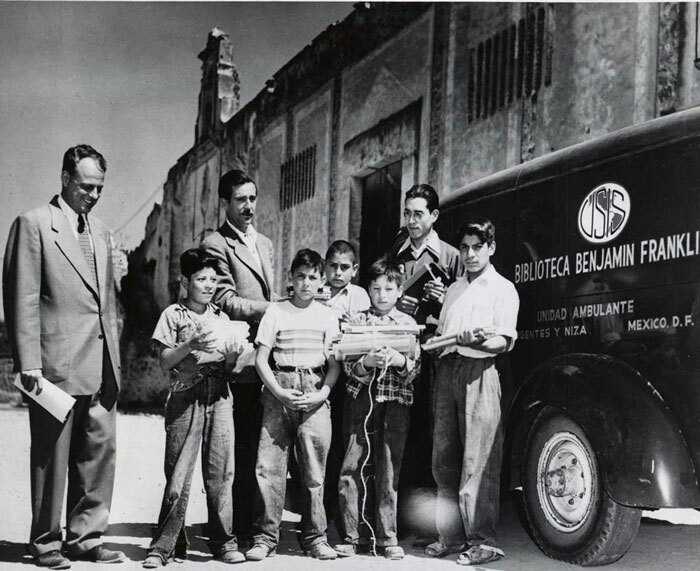 The Benjamin Franklin bookmobile, Mexico City, 1953.